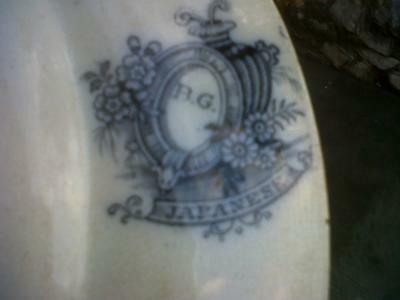 "Japanese" scrolled pattern name on old Victorian Staffordshire blue & white plate with B.G. initials within fancy cartouche oval garter pottery mark device displaying urn & flowers:- 2 x old plates ...willows on plates, blue, pink and yellow flowers on rim. Japanese markings on bottom. This is a nice plate - looks like a beautiful example of good old Victorian Staffordshire blue & white with pink and yellow accents to me. Quite stunning in fact. "Japanese" is the name of the pattern. 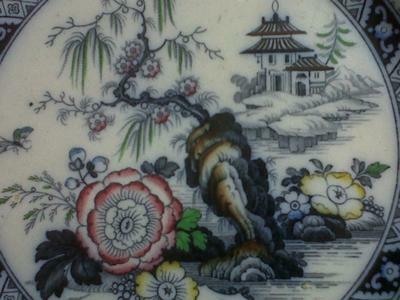 The pretty graphic pottery mark is equally grandiose in splendid typical Victorian overblown styling. ... But who does it belong to - that is the question. It is not an obvious one as this mark does not appear to be shown in my books. However, there are not that many Staffordshire B.G. companies to choose from. In fact, I can only find two. Ben Godwin of Cobridge 1834 - 41 (Goddens don't show this particular mark), but their printed marks did appear to be fancy and cartouche-like. Also they mostly included the pattern name in a prominent place and their initials B.G. Brownfields Guild was another contender - but they were more normally shown as B. G. P. (for Brownfields Guild Pottery Society Ltd) or B.G.P. Co. They were called this BG (Guild) name for a short period of time of 2 years from 1898 - 1900. The maker of your plate could be one of the above makers, could be neither, so until we get further evidence or information, that's that. If I were to put money on it I would roll the dice on Benjamin Godwin - as all boxes seem to be ticked, apart from the entry in Goddens. 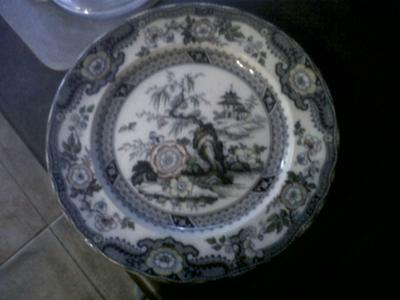 The platter shown above attributed to Ben Godwin in partnership with his brother Thomas. There are big clues here - The cartouche type mark, the position of the mark placed on the rim edge, the prominently displayed "View of London" pattern name. I think we have our maker, don't you? Incidentally, the Godwin platter shown above sold for $350 USD - somewhat more than the estimate. 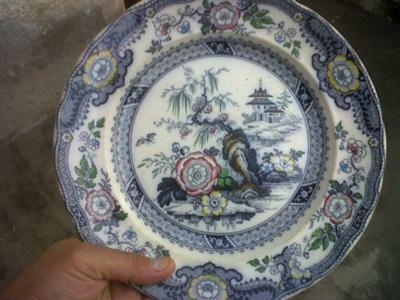 Hi, Have you any idea of the value of these plates as I have two of these. Hi...any idea of price? I have 3 now!